Science, Technology and Society (STS) program students partnered with the 121st Regiment engineers of the Maryland Defense Force (MDDF) to create a new service learning course designed to bring greater appreciation for the challenges and importance of maintaining infrastructure. The MDDF is a corps of volunteers that provide support for the Maryland National Guard. One of their main tasks is to assess National Guard facilities around the state. Colonel Steven Arndt, Lt. Colonel Ed Hubner, and Major Isadore Beattie and other members of MDDF worked with David Tomblin, Director of STS, to develop a service learning course called Infrastructure and Society. 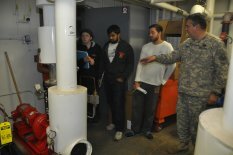 In this course, students learned firsthand how to assess the viability and safety of UMD campus and Maryland National Guard facility infrastructure. Through this process students were awakened to the ways that our taken-for-granted infrastructure, which is essential for a functioning society, are often neglected. They also learned why this situation is common in the United States. The course taught the students a variety of assessment skills, which they were able to use in a practice assessment of a campus building (Symons Hall) and a real assessment of the MG (Brevet) John R. Kenly Armory in Greenbelt, Maryland. After doing the assessment of the Greenbelt Armory, the students were tasked with creating an official report that the MDDF and Maryland National Guard could use to make decisions about necessary repairs. STS students identified several critical problems with the Armory that resulted in immediate remediation. In particular the facility boiler had not been inspected in several years and was in need of service, creating an immediate hazard for anyone using the armory. The students also diagnosed potential pipe failures and pointed out a number of outlet receptacles that were wired backwards that could have resulted in immediate hazards if not addressed promptly. On top of that, the reports documented a large number of less urgent deficiencies in the armory, such as improper security measures, windows that required replacement, and so on. In the future, the STS program and the MDDF will partner to do another course. This past semester the course was a 1-credit pilot course. Next year the STS Scholars program plans to build on this past success and offer a 3-credit Infrastructure and Society course that will satisfy UMD general education requirements.